A powerful, flexible, interactive whiteboard resource, the Cambridge Primary Mathematics Toolbox consists of a workspace and tools that you combine and use to create learning experiences customised for your class. 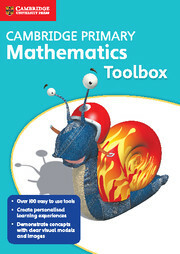 The Cambridge Primary Mathematics Toolbox is a highly versatile resource designed to help you to enhance mathematics teaching and learning. It is the ideal resource to support your creativity and to help you to make effective use of an interactive whiteboard. There are over 100 flexible interactive tools in the Toolbox that enable you to create and save single mathematical activities or whole lessons. Being easy to use, the tools can also be displayed spontaneously within lessons and used to further children’s understanding of concepts. The tools are divided into eight categories: Fractions, Numbers, Calculations, Shape and Space, Measures, Probability, Handling Data, and Solving Problems. The Toolbox can be used in many ways: Planning, setting up and saving a lesson; using unprepared tools in class to support and enhance other activities; sharing saved activities with colleagues. Over 100 interactive tools at your disposal. User friendly and easy to use, even when on the go in a classroom environment. Clear design makes it the perfect visual aid to help pupils comprehend difficult concepts. Colleagues can share and collaborate with saved lessons and activities. The tools can be used in class to support and enhance other activities that teachers already may have in place.